Are you missing summer with its’ warm weather, swimming in a pool or beautiful ocean waters, and enjoying great food on the barbecue? Well, this should help out, at least for the food. This is a delicious and light meal to make on the grill, but when it is 30 degrees outside, you will have to bring the party indoors and make it in the oven. All you need is aluminum foil and the ingredients. This is a quick meal to prepare and only takes about 15 minutes . To make it even more summer -like, decorate your table with summer linens and flowers. No more winter blues. Enjoy! Lay out 2 large pieces of foil, doubled up. On each piece of foil, place 8 Clams, 6 slices Chorizo, 6 tomatoes, some 2 cloves of sliced garlic, 4 ounces White Wine, 1/4 lemon juice, 1 tablespoon Butter and a good drizzle of Olive Oil. Season well with Freshly Ground Black Pepper. Add the fresh parsley.Seal the packages by bringing up all 4 corners then crimping and sealing together. Place on a baking sheet and place in the preheated oven for 15 minutes or until the clams open. Discard any unopened clams. Take the garlic bread and drizzle with the olive oil. Spread the garlic over the bread. 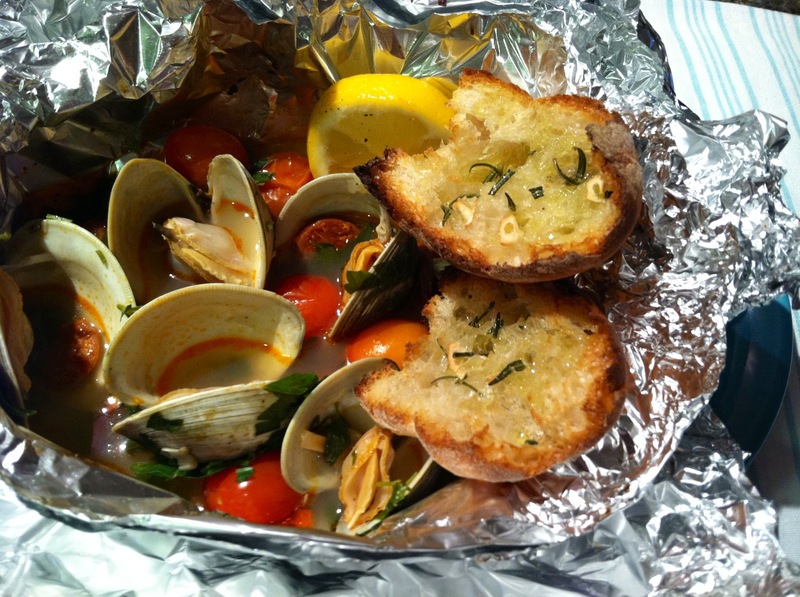 Half way through the clams baking, place the garlic bread on aluminum foil sheet and continue baking with the clams.